1 of 6 Position a rack in center of oven and heat oven to 350 degrees . Line a 12-cup muffin tin with paper liners. 2 of 6 In a large bowl, whisk flour, baking powder, baking soda and salt. 3 of 6 In a medium bowl, whisk milk, honey, oil, lemon juice and vanilla. Pour wet ingredients into dry. Beat with a handheld electric mixer on medium-high speed until smooth and slightly aerated, about 2 minutes. 4 of 6 Divide batter among wells of muffin tin, filling them about three-quarters full. 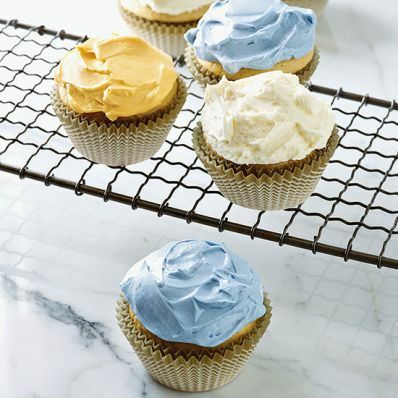 Bake at 350 degrees until lightly golden, a toothpick inserted into center of cupcakes comes out clean, and tops spring back when lightly touched, 18 to 20 minutes. Rotate pan 180 degrees halfway through baking time. Let cakes cool in pan on a wire rack 3 minutes before removing from pan to cool completely. 5 of 6 Note: You have many mix-and-match options when it comes to the nondairy milks and sweeteners here. An ideal pairing is full-fat coconut milk, for richness, plus honey or agave if you want to make a truly vegan cake. But any combination of the sweeteners, milks and oils listed in the recipe works just fine. This is a great basic cake that can be flavored with any variety of zests, spices and extracts.